A world-class seal of approval has seen a new Marco Pierre White-backed restaurant open at the Dover Marina Hotel. 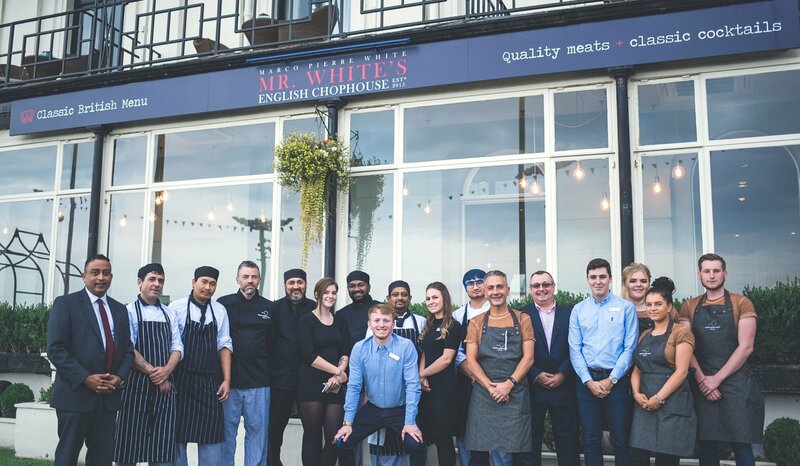 The new Mr White’s English Chophouse restaurant, offering stunning sea views as well as the finest Marco-inspired food and outstanding service, is only the third to have opened in the country. With the first two Chophouses opening earlier this year in London and Manchester, Marco Pierre White’s backing for the third to be established in Dover is a tribute to the hotel and its team and is expected to provide a significant boost to the town. "We are absolutely delighted that Marco has shown such faith in the hotel by allowing us to showcase his brand," commented Managing Director Mr K Rajaseelan. "We are proud of what we have created here and we believe that our partnership with Marco and his Black & White Hospitality company will not just be good for the hotel but will also help to make Dover a destination for people who enjoy great food." The four-star, Best Western Plus Dover Marina Hotel and Spa has a prime position on Waterloo Crescent and offers unbeatable views of the beach and the sea beyond. "As well as great views and Marco Pierre White-inspired food we aim to provide a warm, relaxed atmosphere and outstanding service," Mr Rajaseelan said. "Black & White Hospitality clearly agrees that we have something special to offer." Chophouse is the latest restaurant concept to have been unveiled by Marco Pierre White. At the Dover Marina Hotel, the 84-cover restaurant will serve a range of fresh, high quality meat cuts alongside traditional home-grown classics such as goats’ cheese and beetroot salad, chateaubriand, roast rump of lamb and fish pie. Welcoming the new restaurant in Dover, Marco said: "What’s appealing about the Chophouse is its simplicity. The menu is very simple and the whole idea is to be generous with the portions. It’s hard to beat classic British food and that is exactly what the Chophouse delivers, alongside a fine collection of wines, cocktails and beer." Dover Marina Hotel General Manager Suresh Abbas said the new restaurant followed a complete refurbishment of the hotel and was the next stage of its development. He added: "Introducing Marco Pierre White’s concepts truly elevates what we do and we’re delighted to be bringing Chophouse to Dover." Nick Taplin, CEO of Black & White Hospitality, commented: "We have already had great success with our Chophouse concept and we know how popular it is with diners. The seafront at Dover offers the perfect location and we are confident it will become the place to go for local foodies and tourists alike."